A couple of days ago I mentioned that on November 9th the curtains go up again on Lucky Shops, the ultimate shopping event in NYC hosted by Lucky Magazine. But why wait til then? Enjoy some of the excitment of this shopping extravaganza right now by entering this competition to to win a Lucky Shops VIP Gift Bag packed with over $800 of goodies! We love Lucky Shops — the ultimate shopping event featuring the best brands hand picked by the folks at our favorite magazine, all selling at up to 70% off. 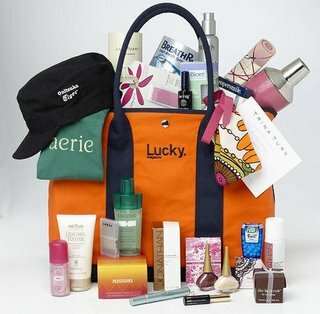 Now we love those LUCKY girls even more, because they’re giving us a chance to win a VIP Gift Bag (value over $800) plus two tickets to Lucky Shops, November 10th in New York City! Marc Jacobs, Chloé, Balenciaga, Theory, Catherine Malandrino, Sigerson Morrison, Zac Posen will all be there, plus so many other great clothing, accessory, and jewelry designers. Enter to win now or buy your tickets and check out the rest of the designers at Lucky Shops. The Lucky Shops VIP GIft Bag giveaway promotion is now closed!